Monster Tale is a Nintendo DS game in the Adventure genre. The game was published by Majesco Entertainment and developed by DreamRift. The game has an ESRB Rating of E (Everyone 6+) and was released on 2011-03-22. 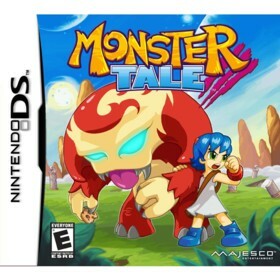 The game's official site can be found at www.majescoentertainment.com/games/nintendo-ds/monster-tale. A Monster of a Tale! Monster tale is a really nice action/RPG/pet raising game by Dreamrift and features excellent graphics, superb music and an interesting story. The game stars a female lead character named Ellie who is transported to a Monster World. Ellie almost immediately runs into trouble and encounters other human kid kings and queens who have taken control of the monsters in order to gain power. Ellie immediately finds a bracet of power and then meets her "pet" Monster Chomp. Chomp is the son of the former Monster queen who was usurped by a human girl and primary nemesis of Ellie and Monster World Priscilla. The game is a nice combo of action, platforming and monster raising. Initially you begin the game with very few power-ups and a very weak pet monster, but you will gain powers relatively quickly by defeating the various monsters within the game. Each section of the game is broken down into individual areas or regions and you must defeat each "king" or "queen" boss to to unlock the next area. I found the game quite enjoyable with one exception....the backtracking. The developers chose to make this game a bit too Metroid like in terms of gameplay...by this I mean that after you gain a new ability you must go back to a previous area or areas to advance the story...this gets really monotonous after a while :(. The good news is that the "pet" raising element of the game is so fun and with the numerous items and pet forms to unlock you will want to keep playing even though the endless backtracking will get tiresome. I also found a couple of the boss battles a bit too challenging and feel that they should have lowered the difficulty a bit to help casual gamers :). I have to point out one of the best features of this game are the music and visuals. I don't think I have ever heard more beautiful music on the Nintendo DS...you will really be astounded when you hear some of the tracks. The graphis are also amazing and feature bright and colorful sprites with excellent animation. Overall this game is a fantastic pick up and play action adventure game similar to Mega Man and Metroid and will provide you at least 10 hours of gameplay. This is a must buy and one of the sleeper hits of the year.